First Alert Meteorologist Ryan Phillips has a look at Tropical Storm Philippe and the 11 p.m. advisory. Tropical Storm Philippe has formed in the Caribbean Saturday, and expected to bring heavy rain and winds to South Florida. The National Weather Service has issued a Tropical Storm Watch has for coastal Miami-Dade County and the upper Florida Keys. Flood Watches for Miami-Dade and Broward counties have also been issued. A Flood Watch remains in effect for South Florida until 8 a.m. Sunday. On Friday, the National Hurricane Center named the system Potential Tropical Cyclone Eighteen. 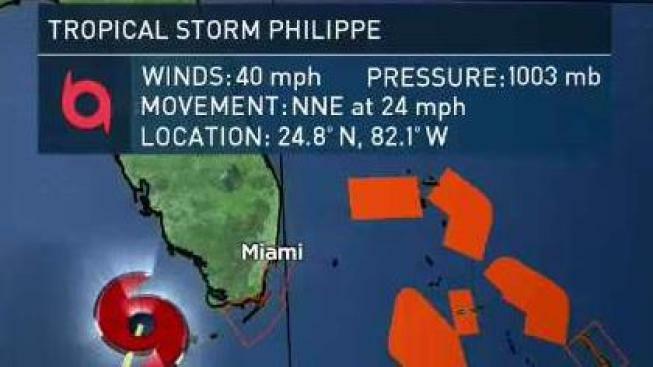 As of 11 p.m. Saturday, Tropical Storm Philippe was located about 25 miles northwest of Key West, Florida, and was heading north-northeast at 24 mph, with maximum sustained winds near 40 mph. A tropical storm warning was issued for the Cuban provinces of Isla de la Juventud, La Habana, Ciudad de la Habana, Matanzas, Cienfuegos, and Villa Clara. The warning was also issued for the northwestern Bahamas, including the Abacos, Andros Island, Berry Islands, Bimini, Eleuthera, Grand Bahama Island, and New Providence. It's expected to stay to the south of South Florida but could bring three to five inches of rain to the area, with an isolated maximum of eight inches possible. Because of the potential of locally heavy rainfall, the NBC 6 First Alert Weather Team has declared that Saturday will be a "First Alert Weather Day." The good news is that only half of the weekend looks to be a washout. A cold front arrives on Sunday morning and will quickly push the storm and the rain away and bring in some gorgeous weather Sunday afternoon into Monday with temperatures dipping back into the 50s. Download the free NBC6 app to check First Alert Doppler 6000 anytime.